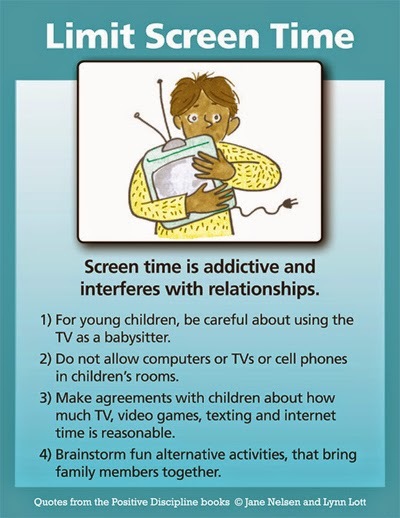 Children are now faced with increasingly more options for screened entertainment, leaving families disconnected and disengaged. 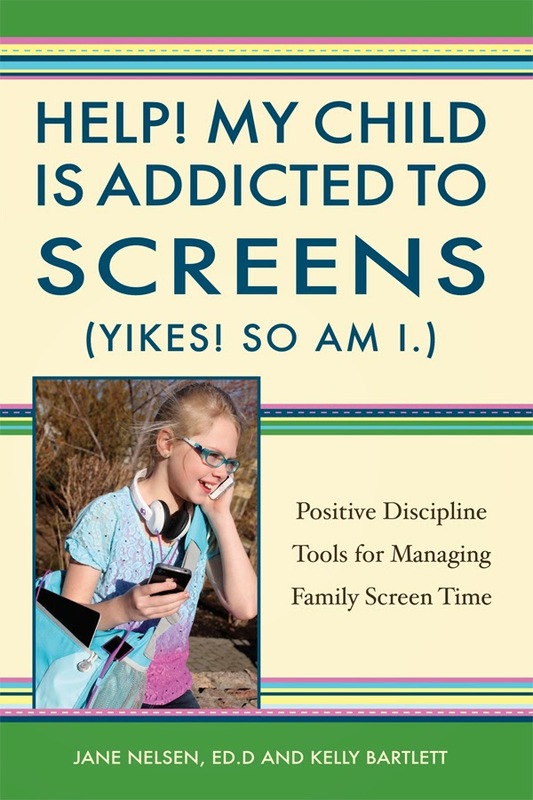 Learn Positive Discipline tools that will help you and your children connect more with each other and find a balance in your family's media use. My 13 year old son with Asperger's is very addicted to the screen in general. He plays a certain game on the computer and even has his own server. We even included more screen time if he went to exercise with me once per week. Bad idea on my part, since I never follow through to take him to the gym. I am convinced that too much screen time is bad for him. But, I am honestly afraid of the fallout, or "withdrawal" period. His withdrawal may or may not be more disruptive to our family because of his Asperger's. Although, I'm guessing any kid so addicted would have a similar reaction to him. Is it a good idea to offer a replacement desirable privilege. I can't imagine what it would be for him, however. Thanks. I saw your comment and wanted to find out a little more info. I have a daughter with Asperger's and I know how important screen time can be to these kids. How much time per day is your son in front of a screen? What does he do when he is not allowed to be on a computer or watching TV, etc? Is he verbally communicative? I know that there are so many different levels of functioning, and it seems to me that this could make a difference in your family's approach to screen time...but I think that there are certainly some alternatives if you feel that he is on the computer too much. Hope to hear back from you : ) Oh, by the way, does he have any other focuses...animals, cars, buildings, sports? And what is the game about that he loves to play so much...is there something that can be taken from that as a clue to some activity that he might engage in with you? Thanks, Kendra, for your response. The game is Minecraft. He has online "friends" with whom he plays and "chats" while he plays. Most of them happen to live in our town, as they are friends with his only friend, a girl of the same age. He has never met them in person, though. My son goes to an online school, so he spends 6 hours per day on the computer (mostly) for that. Then, 3-4 more on the computer for Minecraft. Right now, his area of focus IS Minecraft, but it has been guinea pigs, as he has two. He is also starting horse therapy, which is once per week for an hour. If "forced" to do an outside the house activity, he gets out. Otherwise, he'd rather stay home and play the computer. He's thinking about going to a "normal" school next year, though, where he would have built in friends ~ the ones with whom he plays Minecraft. We're considering it, although the online school has been very beneficial with his stress level. My daughter is 13 also, and horses have been incredible for her. We live in the country, and she has been riding on and off since she was 5. She has trouble relating to humans sometimes, especially her own age, and we found a wonderful trainer who studied with the horse whisperer - and it has been such a gift. Hope your son connects with horses too. My daughter also does school at home on the computer - she was just getting lost at public school. It does sound like your son is on the computer a lot, but with his schooling it is understandable. Also sounds like the game is providing some social skills? My daughter likes SIMS, and sometimes I sit with her and we discuss her family's interactions, etc. I try to use it as a tool. My daughter gets one hour a day Monday - Friday, and two hours a day on the weekend if all school and chores are done. Maybe he could earn "fun" screen time by doing outside activities, horse therapy, walk in the park, etc? We've had good luck with that when we felt that things were getting out of balance. Asperger's is challenging sometimes isn't it : ) You sound like a great mom! Don't think I was much help...sorry. I'm 100 percent with you on this!! Kendra, thank you again. You were a lot of help. You made me think about this even more. It's nice to know that someone with a child with Asperger's is using Positive Discipline as well. I also have a son with Bipolar who just hit the son with Asperger's in the face with a remote yesterday. I'm never sure how to deal with that without a consequence, per se. That's not related to this blog post, though. On topic, I think if we go back to 2 hours of computer time during the week and he can earn more with chores and out of the home activities and exercise, that might work. Great idea. Thanks. I'm going to check out your blog. I have a blog, too. Thanks. I have a bad tendency to take one kids side over the other, different kids at different times, and I have found the PD tool "Putting kids in the same boat" to be very helpful with this. Positive Time outs have also been great, for me as well as them, and then after we cool down we can process what they were feeling before the fight, how to recognize when they are about to get physical, brainstorm alternatives, etc. There are just so many tools in Positive Discipline, and I have found that they are effective whether or not a child has special needs. If you don't already have the Positive Discipline A-Z book, it is great, and makes looking up ideas and solutions very easy. I love mine! We found a great way to ween our kids off tv. Children's audiobooks. It's not as good as reading, but it's a great half-step and it's way more engaging than staring at the idiot box. We download them for free at http://www.twirlygirlshop.com/stories-for-kids. This sounds great and i have noticed my girls have too much screen time. I have a 3 and 8 year old. Im a stay at home mom and must admit, i use the tv as a babysitter to get housework done. My question is does anyone have suggestions on activities that both my children can do at their age levels and not get bored? I have a hard time finding things that my 8 yo finds entertaining and fun and hard time finding things my 3 yo can do or understand how to do. Oldest finds a lot of them too babyish. Any ideas? I've been reading a lot of articles about'limiting screen time' I agree with it. I do allow my child to watch some kids shows but I don't want her just sitting in front of the TV watching whatever pops up next. I found a website(www.kidobi.com)which lets me make 'playlists' of shows for her based on what she likes and weed out the shows I don't want her watching. Even better, they have an app that i downloaded for free and I have that on my ipad for long road trips.